I am both an environmentalist engaged with the broader progressive movement, and also a campaigner against plastic pollution; particularly single-use disposables. In this way I have always been a water protector at heart. I worked diligently with partners across the state, including Clean Water Action, to help ban plastic microbeads and protect California’s ban on plastic bags. And I continue to root for Clean Water Action’s Rethink Disposable campaign, which aims to work with businesses, individuals, and institutions, to stop single-use disposable trash getting into the waste stream in the first place. A white woman, I’m an ally and supporter of the racial and environmental justice elements of the Standing Rock protest, fundamentally. While I hoped to bring my expertise to bear at camp, I also had to ask myself what it really means to be an ally. A few of us with waste management and diversion experience, and who recognized the need for some sort of basic infrastructure, managed to find each other around the dumpsters at camp. First and foremost, we approached the tribal elders and asked if this is something they wanted help with. With the elders’ blessing, we began by making signs reminding people to pick up trash on the ground, asking them to pack their trash out if they were there for a short time, to reuse materials when possible, and to pick up bags of trash on their way out, as it costs the camp money to empty the dumpsters. Some of us hauled trash bags from camps, and some of us made sure that “pack it in, pack it out” was a message relayed at orientation along with picking up trash. 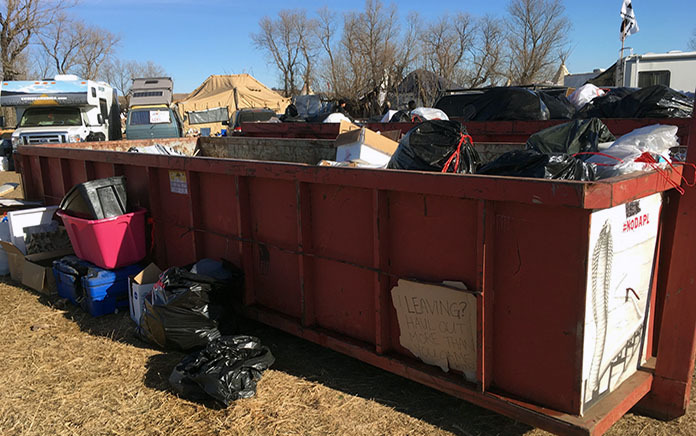 Others organized volunteers to: pick up trash on the ground, sort the trash from the recycling in the dumpsters using repurposed bins that had been thrown away, and haul the sorted recycling out in the extra car space where donations had filled their vehicles on the way in. Even though many were grateful for the work we were doing, most didn’t vocalize an understanding of the connection between our consumptive society of convenience, and the pipeline that would be transporting the oil used to support it. This led to thoughts on how to get us all to think more often about the connections between these issues, and to change our behavior as a result. Much of the trash was plastic; made from the very substance, oil, that everyone was there to fight against. Not only that, but with plastic being so lightweight, it often blew out of the dumpsters or people’s camps the moment the wind picked up. Trash in the environment is never a good thing, but it was particularly difficult to see it end up in or near the sacred river that we were there to protect. Still, I didn’t feel it was the right place to try to “educate” folks. Just as Portland’s Greenpeace protesters in 2015 were often criticized for using plastic canoes to stop oil companies from drilling in the arctic, I didn’t want to taint a cause with centuries of precedent by harping too much about the damage done by plastic pollution. As an example, when my tent neighbor was winterizing his tent with Styrofoam insulation and small pieces were falling to the ground, I couldn’t help but remind him how detrimental it is to wildlife and the environment. Fairly enough, he reminded me about his priorities in being there. So I had to come to terms with the fact that my Waste Warrior team and I were doing the best we could to remedy a situation that could have become worse, and simply let my new friend get on with it. I hope that in the future, we can all find the time and space to consider more the interconnectedness of all things, including pipelines and waste. For the time being, though, I’m proud to have stood with the water protectors at Standing Rock, and to have done my small part as an ally in this important fight.